It doesn’t get much better than being approached by the chairman and executive producer of the Royal Variety Performance with a request to book The Vegas Show Girls for the official after show party of the Royal Variety Performance 2015! We were thrilled to supply 8 of our glamorous, leggy Vegas Show Girls for this prestigious annual event. which was held at London’s Park Lane Hilton Hotel this year. Guests included stars from stage and screen, many of whom had appeared earlier in the evening at the 2015 Royal Variety Performance held at the Royal Albert Hall in London. This year in the presence of HRH Prince Harry. Royal colours were selected for The Vegas Show Girls to wear for this event (our striking gold and white show girl feathers). As our 8 gorgeous girls posed for photographs during the drinks reception many celebrities stopped for a quick photo with the girls in their finery. Who can blame them?! 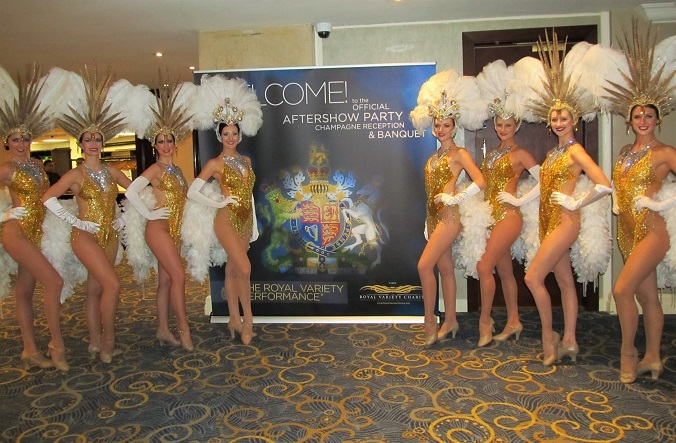 The Vegas Show Girls continued to wow guests throughout the evening and their is talk of us being invited back to next years Royal affair. Watch this space!